Mo Appleby's life changes dramatically when he and his mum move across the street to live with his new step family. When weird things begin happening, Mo realises they’re something to do with the odd woman who his moved into his old house. Why does she always keep the curtains drawn? What’s her association with the strange new people in town? And what’s the connection with the mysterious disappearance of his father? 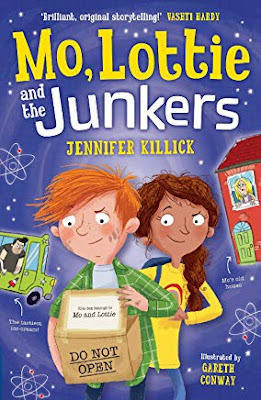 Mo and Lottie, his spirited new step-sister, join forces to solve these mysteries little knowing the danger they will soon find themselves in. This is a joyful book. Funny, heart-warming and also at times genuinely scary. It’s populated with all manner of weird and the wonderful characters that keep the story bouncing along at a thrilling pace. It’s a great read – entertainment for sure, but with some thoughtful themes that give an extra bite. I will be reading more by Jennifer Killick. A quick shout out for Gareth Conway’s exuberant cover too. 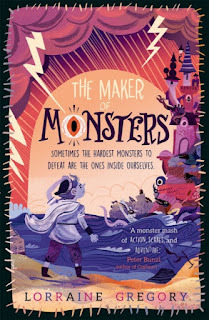 The Maker of Monsters is the latest middle grade novel from Lorraine Gregory, author of Mold and the Poison Plot (winner of the SCBWI Crystal Kite Award 2018). It's a glorious, multi-layered adventure with a BIG heart. Meet Brat. Life is tough for Brat, very tough. How would you like to be feeding vicious monsters through the bars of their cells? One wrong move and you'll end up being their dinner. But the endearing character of Brat takes all this on the chin. Brat lives on an isolated island in a castle owned by Lord Macawber. He should be grateful... his master rescued him all those years ago after-all. However, in recent years his Master has become more and more obsessed with making monsters - grotesque, frightening monsters in order to carry out his grand plan. The only light for Brat is the company of his unique friends - Sherman and Tingle. Lord Macawber's grand plan swiftly becomes too grand for even him to handle, the monsters escape lead by the most deadly and fearsome one of all. Now it's up to Brat to face his fears - to cross the water and warn the other communities that their lives are in danger. Immediate danger. Brat's journey is non-stop. The pacing of this novel is incredible - Lorraine Gregory how do you do it?!??! This is a real heart in your mouth type of adventure, each chapter is chock-a-block full of action as the plot moves at a wonderfully satisfying pace - great for reading out loud in classrooms. In Brat, as with Mold, Lorraine has created a supremely like-able character - one with flaws, and a huge heart that the reader is cheering on from that very first chapter. Go Brat! You can do it! 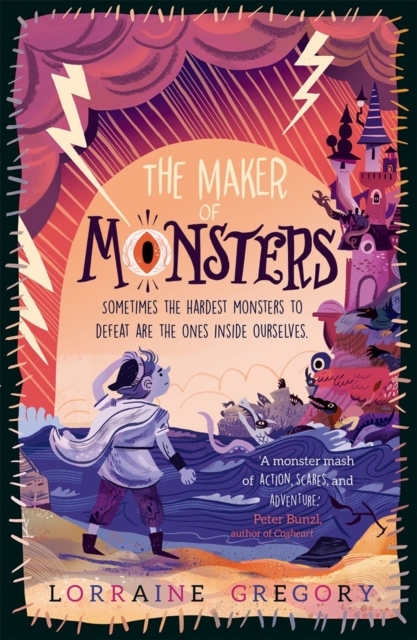 The Maker of Monsters is hugely enjoyable. Highly recommended. Emma Perry is a children's author, Primary School teacher & founder of MyBookCorner. I recently wrote on our sister blog, ABBA, about books I read as a child which had the power to create a wholly convincing world which was immensely attractive to the young reader I used to be. (See here. )Of course all good books do that up to a point, but there aren't that many which leave you with a slight sense of loss when you read the last page and find yourself on the outside once more. He didn't know how to be brave. Whenever he watched 'The Lord of the Rings', he imagined himself as a lone rider galloping away from a battle while all the other characters were marching into it. When everyone else was in Helm's Deep, he'd be back in the Shire, making a sandwich. His mother is ill, with a deep sadness which is clearly connected with Fionn's father's death by drowning before Fionn was born. Fionn is afraid of the sea, which is unfortunate as he is travelling to an island, Arranmore, with his sister Tara, to stay with their grandfather. Oddly to the reader, Fionn has never been there before: there is clearly some mystery associated with the island, his father's death, and his mother's illness. Fionn's relationship with his sister is very real. She's thirteen and he's eleven; until she turned thirteen, they were close, but now that's all changed as she's discovered lip gloss and boys, in particular one Bartley Beasley. 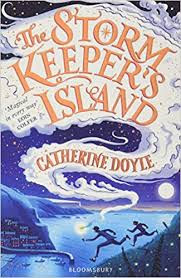 Catherine Doyle is very good at dialogue - Fionn and Tara's exchanges are spiky and funny. Yet underneath the bickering, they are close, and in the end, Tara will need Fionn to save her. Because it turns out that this island is magical, and is in the care of the Storm Keeper, Fionn's grandfather: but the old man's power is dwindling (in a very human way that many of us will recognize), and Fionn, though he knows nothing of it at first, is to be his successor, with great power at his disposal - and a dark and ancient enemy lying in wait for him. The book is beautifully written. The characters are very human and very real, as is the world they come from. And perhaps this is what makes the magic seem perfectly feasible: that and the fact that it is contained in the environs of this island off the coast of Ireland - which is a real place, and one the author knows well, and clearly loves. It's not often I can't put a book down, but I read this one late into the night until I'd finished it. There is to be a sequel, and I've a feeling I've read somewhere that there will be more in the series to follow, which I think is excellent news. My own blog, A Fool On A Hill, is here. Two picture books today! The titles have been out a year or more and they were copies I selected from the children's library book-boxes ready for an Under-Fives Storytime session last Monday. - have a touch of suspense and drama - not jut one object after another per page. and attract and interest me a lot. My first book was LEAP FROG by JANE CLARKE and BRITTA TECKENTRUP, published by Nosy Crow. (2019) The setting is a bold collage-effect rain-forest or "jungle." Felix the little tree frog, made obvious by his bright green colour is trying to find someone or some place he knows. However, being only little, he is scared by the many noises he hears in the jungle. He meets three frogs, a friendly turtle, a beetle walking across the leaves, monkeys throwing down their nutshells and . . . a swooshy-whooshy snake! Luckily, Felix escapes up a tree-trunk, meets a woodpecker and then - making the reader turn the whole illustrated spread vertically - finds his way up the tall tree trunk. At the top, there's another noise but Felix is not scared this time. He knows that noise is his Daddy waiting for him at the top of the tall tree. 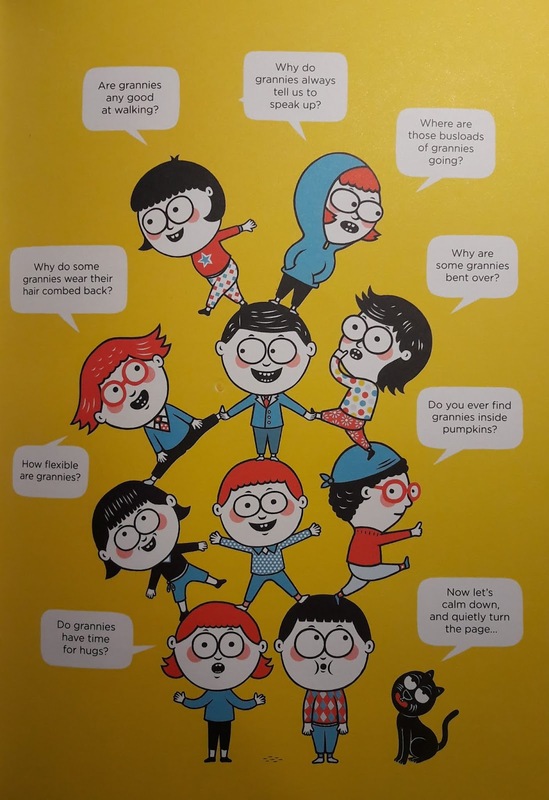 What I liked was the way the text speaks directly to the reader with invitations to join in or repeat lines, whether the scary sounds - Pitter Patter Rustle! Rustle! - or involvement in the action of the story: "Don't worry little frog, there's nothing to be scared of" or counting our way up the 10 branches of the tall tree. By the way, I took along a small toy frog and a turtle to introduce the story which also helped me to start by talking about the book. It was fun! The second book SHH! WE HAVE A PLAN! by CHRIS HAUGHTON (Walker Books 2015) made me laugh when I found it and read it through. The unsuccessful "plan" of the title had such echoes of Blackadder that I took it home as well, to do a couple of small practice try-out reads. It was also NOT a sweet story about cuddly animals and bedtimes, of which there seem to be plenty, and had an eccentric cartoonish look. The pages, a collage of deep blues and purples, creates a sense of night-time. A small gang of jokey baddies appear, trying to creep soundlessly through a wood. We see the trio simply: just dark shapes with worried expressive eyes and gloomy blue faces and I'd suggest the fate of the plan is evident from their whole appearance. Each character - one big, one middle-sized, one smaller - carries a net and we soon see that they are planning to catch a small brightly-coloured bird. tip toe slowly tiptoe slowly now stop shh. This storybook is very good for reading dramatically and for some enjoyable joining in - along with reassuring asides like "I don't think they'll catch the bird, will they?" if necessary, because, of course, when the characters do get close enough to the bird, things don't go quite as expected. It is also quite short, so it could be quite good to read again a second time, I'd guess - if you hadn't already over-run with the songs and instruments. Thank you, all you authors and illustrators. I was very pleased to have such good reading fun with these two books! As ever, I begin my review with a disclaimer. In this particular case, two disclaimers. 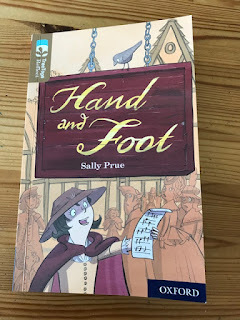 Sally Prue is a good friend of mine, and OUP have published two books of mine in their reading scheme. 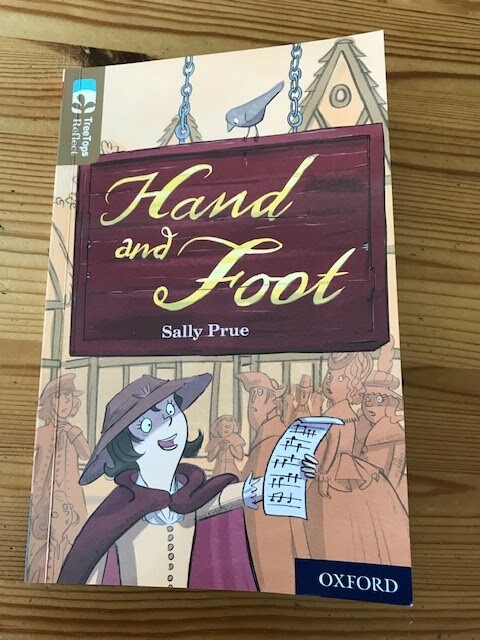 But Sally is a wonderful writer and my readers will have to trust me when I say that I wouldn't recommend a book I didn't admire and felt I wanted everyone to read. So to this book. It's another belief of mine that far too many good books pass unremarked because they're part of a Reading Scheme and will not be seen in bookshops or supermarkets. These books are not 'important' by any standard except the one that really matters: will it entertain, involve and also teach its intended readers? Will children on their way to literacy (the most precious of precious gifts) have a good time? Will they want to know more about what they've learned already? Will they discuss topics raised by the story they've been absorbed in? Does the book stand a chance of winning over those who think reading is somehow uncool? Difficult? The answers to all of these questions are asked regularly by teachers and educationists, but not by reviewers. I like to draw it to the attention of readers of this blog. The story concerns the wonderfully-named Gravity Sparrow, who is short and energetic, determined and a singer as well. She has been taken in by a rich family from her beginnings in the workhouse. I learn from a note in the back that workhouses named their orphaned charges thus: first name a virtue, and second name a bird. Later in the narrative, Gravity meets someone from her workhouse past called Faithful. Gravity is a servant in the house where Marianne, a rich and rather cross young girl, lives with her family. Marianne longs to go to school, but is landed with being taught, most boringly, by Miss Dobbs, her governess. At the beginning of the book, Lawrence, Marianne's brother goes off to school, and her parents leave the grand family home to take him there and then to visit 'their Northern factories." While they're away, Gravity loses her job and is cast out for being a thief. A locket has gone missing and suspicion falls on her. We all know she's innocent but it's only after many adventures and scrapes and meetings and different exciting and sometimes farcical situations that order is restored. The parents return and Gravity is reinstated, vindicated. Also, the possibility of a proper education in a school looms for Marianne. The 1790s were a time of great change both in technology and in science. The huge gap between rich and poor widened. Girls, of course, were not important in the hierarchy and poor, orphaned girls were at the bottom of any social ladder. Having two contrasting heroines in Gravity and Marianne illustrates these differences very well for young readers. Prue is kind to her characters, even the really nasty ones. She has a benevolent eye, though nothing escapes her. She can see every inadequacy and though it's never laboured, she gives her opinion of people subtly. Our first sight of Sir William (the local bigwig's) steward goes like this: "It was on the fifth day of Gravity's new life that a smooth-faced gentleman rode into the yard." We know, don't we, that he's going to be a baddie just from that perfectly-judged adjective? The illustrations by Alex Paterson are delightful and capture the fast-moving action very well. I'm going to end by quoting Prue herself from the introductory page she's written for this book: "Above all I discovered that although in those days everything was different, everything was also the same: bad people needed to be faced with courage, and good ones rewarded. That's Gravity's story and Marianne's story, and it's mine. And of course it's yours too." This is well-written, fast-moving and involving book. It also has a soundly-set moral compass. If you possibly can, do seek it out. Did your granny look like this? Nor mine. 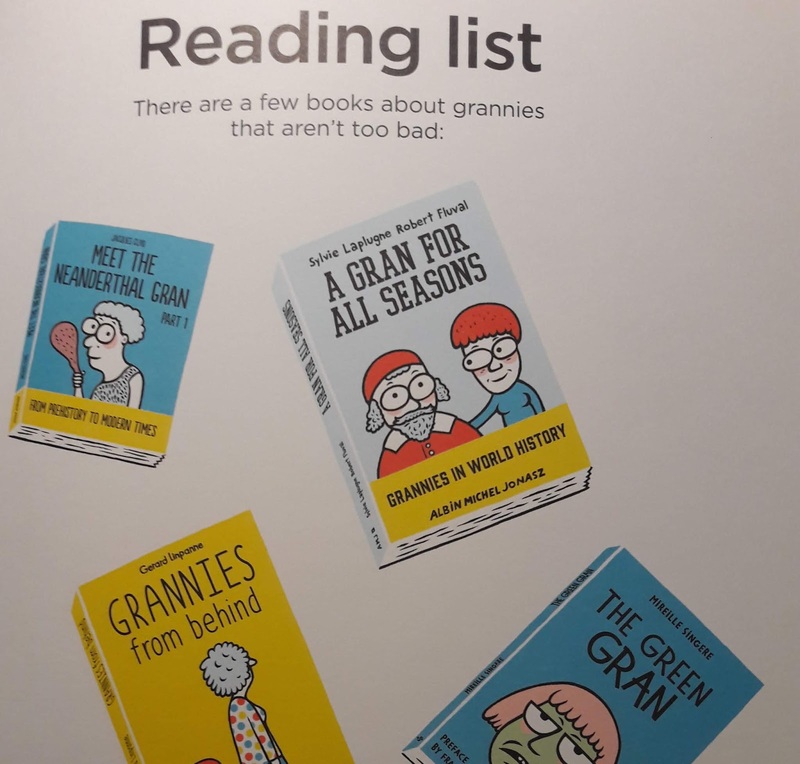 But today's grannies are different and this guide to modern grannies is just what you need if you are stuck with anachronistic expectations of grannies. 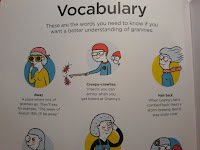 Declaration of interest: My grand-daughter calls me "Ba" because grannies are old and I'm not old. It was very reassuring to read that some grannies are 58 *and they still count*. Hurrah. I was very reassured by this book. It begins with a run-down of the types of grannies you might encounter, including those from the city and those from the salt flats. 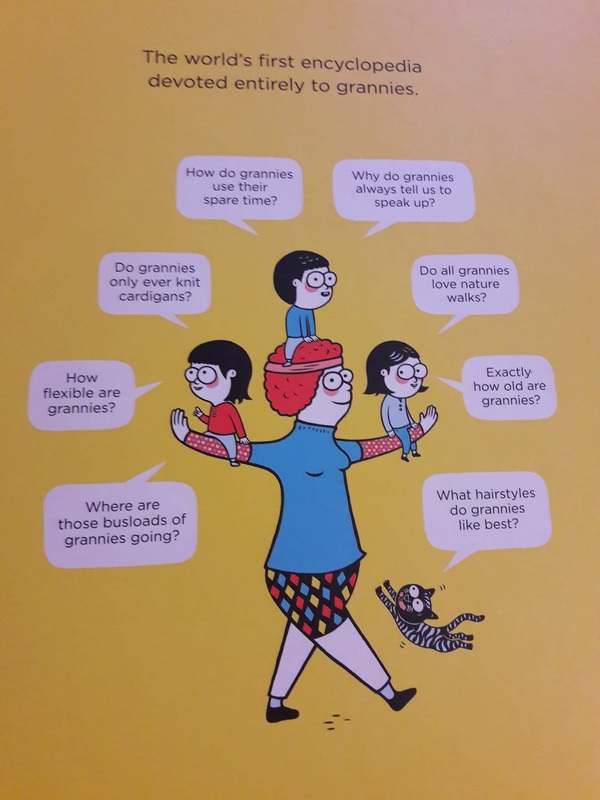 Then it answers all sorts of crucial questions about grannies, such as how old they are, what's inside a granny, how bendy they can be, what moods they have and what you might find in their beds. A few questions are raised but not answered, such as why they have creases and why they go on buses. I guess these are mysteries beyond the wit of man to solve. It's a fabulous, quirky, cheery, bright and dip-into-able book for grannies and owners of grannies alike. The illustrations are a delight. 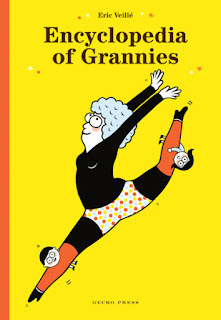 All kinds of happy grannies and grandchild in glorious technicolour. Even those that have grey, permed hair are not dreary. This is just the kind of up-beat exposure grannies need. Quite apart from the book being full of fantastic insights into the secret world and true nature of grannies, it's also very beautiful. 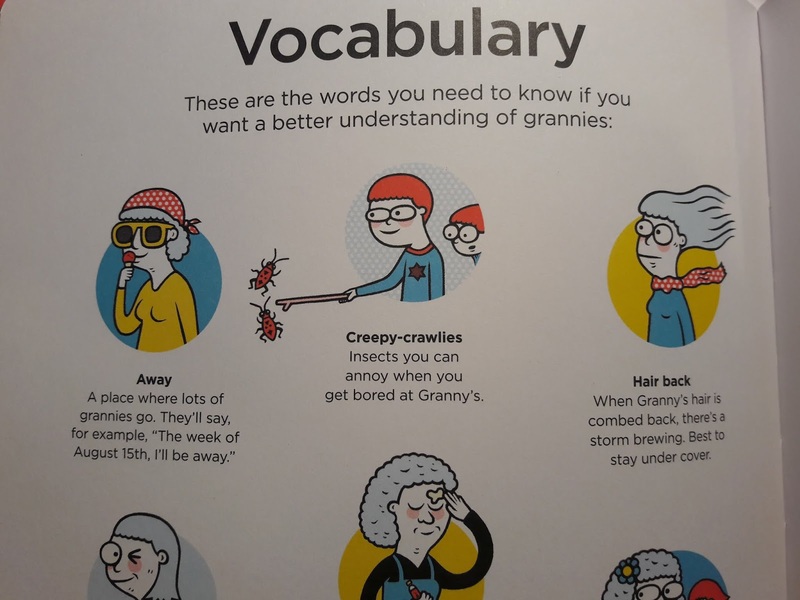 The design even keeps in mind the perils to which grannies are commonly exposed. It has rounded corners, which means when your grandchild waves it around and pokes you in the eye it doesn't hurt as much as other books. It has beautifully cheery end-papers in orange and blue so you easily find the start and end even in a dimly-lit small person's bedroom. The spine is orange and the cover yellow so you can find it readily either on the shelf or in a pile of random child-detritus on the floor. I have only one quibble with this book, and I'm surprised the editor at Gecko Press didn't pick this up — all the grannies are white. Really? In 2019? The book was originally published in French; perhaps French publishers are not up to speed with diversity yet, but it's a shame. Secrets and lies . . . secrets and lies . . . Fourteen-year-old twins, Kaine and Roxy, used to be close, but now they can hardly bear to be in the same room. Roxy hates the way her brother behaves - Kaine might be brilliant at football but he's always in trouble and cares nothing about his family. And Kaine despises the way his supposedly-perfect sister, dominates their parents in her ambition to reach Wimbledon. But the twins are both hiding dangerous secrets of their own, secrets that could destroy everything they are working towards - and both Roxy and Kaine's survival hangs precariously in the balance. Readers are probably most familiar with Dan Freedman's football books for kids. His series of novels for younger readers featuring his character, Jamie Johnson, have gripped tens of thousands of kids. As Freedman's background is in football (he was a football writer and even the FA's editor) he established himself in the world of children's books with a genuinely exciting set of stories based around the game. 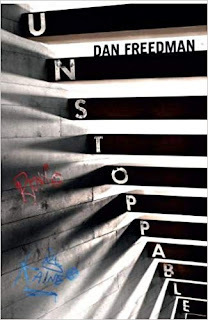 Unstoppable is slight swerve-ball from his established playing field, but one that he definitely scores with. Freedman is an inspiring speaker in schools and had a huge impact on the kids in my school when he came to visit. He has a very natural rapport with young people, and this understanding shows in Unstoppable. Possibly in no small part due to the fact that this new book has been inspired by things Freedman has heard or been told by pupils in the schools he has visited. Football is the lace that threads this novel together (and tennis strings things along too), but the action really hinges on the main players, their relationships with their families, and the sports that they feel define them. Kaine and Roxy are instantly relatable and the way they talk and act does feel very real. The interplay of sibling rivalry never feels as if Freedman has casually gender-flipped the situation. Kaine and Roxy are both very strong characters. The twins feel very different from each other, but ultimately it is their likenesses that both build and resolve the story. This is a very strong book and one that is a blast of the voice of youth. It deals with issues such as gang culture, youth stress and depression, unemployment, parental pressure, sibling rivalry and the kind of family crises that most will recognise. Unstoppable deals with them with refreshing honesty and never feels preachy. I hope this book will get the attention it deserves. Dawn Finch is a children's author and librarian.